"La Practica fa la Grammatica"
Well this is happening. Italian class. The first hour? I was excited. The second hour? Mama Mia, I realized I could have been home watching "The Voice"! "So, did ya have fun?" the Better Half inquired when I walked in the door. Wellll, let's just say that conjugating verbs in Italian is about as much fun as it sounds like it would be. But I shall prevail. Because as Mario Batali says "Spaghetti is love." Which really has nothing at all to do with learning Italian but...it reminds me that I'm hungry. Ciao. I have a few key Japanese words phonetically prompted on my iWatch for daily practice: 10 am: "repeat sue-me-mah-sin" - which means 'excuse me', something Allyson tells me I will be using often. Cheeky girl! Good luck and kudos - I am convinced that you learn 2nd languages better either early on or in your semi-later years. I had very little use or interest in French when I was a freshman in high school - now I wish I would have paid more attention (especially since we're going to Europe next Spring). That's beautiful. Such a cool B&W shot! Good for you -- you luck! Beautiful shot...love the B&W. Buona fortuna with the Italian! Visiting from Little Things Thursday. Oh Kathy! I absolutely LOVE this photo! Great black and white and awesome contrasts! Good luck with the class! Love the B & W shoot. And as far as learning Italian goes as long as I know how to order their marvelous dishes - I'm OK. I'm proud of you! As a former second language learner I will say that after 6 months you will feel empowered! It's a great feeling. And if you get to take those skills to the friendly skies, even better! Good luck ... they say it is good for your brain. Lovely picture to go with your post. See what you are doing with your empty nest time! The schedule for Arabic classes came out last week. I know I need to sign up, but I am just so intimidated after my failure with Deutsch. Good, good luck! Spaghetti AND red wine is love. And Italiens will love you with or without speaking a grammatical correct Italian. After living for so many years in a French speaking country I just gave up...smile ,be happy and red wine is always good for your health and spirit! 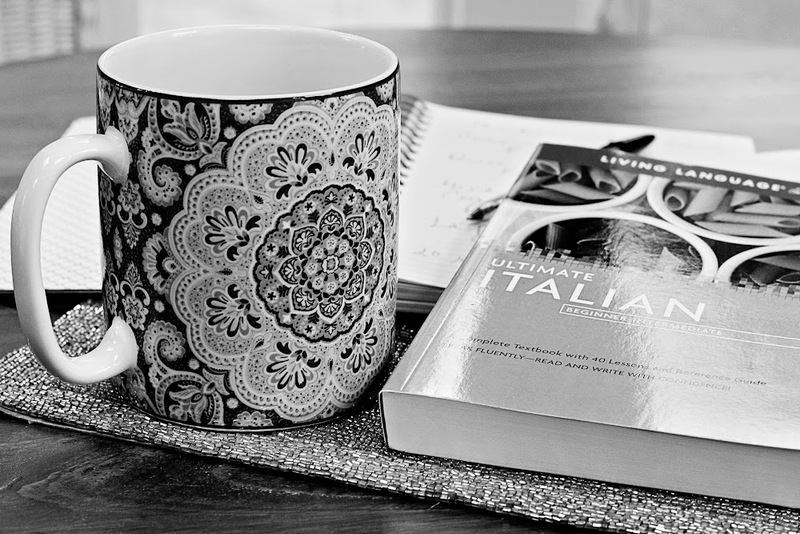 I took Italian classes at college (for two years). I loved them. What a lovely photo for monochrome. The details of the cup, especially, are just awesome. LOL! Are you getting ready to visit Italy? Wow, you are taking on a big challenge! Best of luck to you girl, I know you can do it!! Thanks for sharing with SYC.